We make sure that the packing of our products is done using quality materials and advanced machines. Our packaging experts handle the entire task of packaging keeping in mind the requirements of the clients. Association with trusted vendors enabled us to meet the quality expectations of the clients. We source only premium-grade raw materials from the reliable sources after complete checking. Polyurethane Materials having high breaking point offers excellent elasticity. 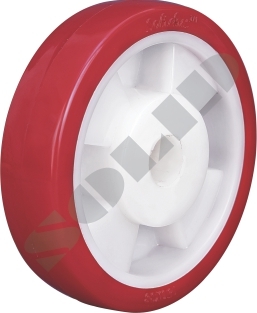 Wheels center made of PPCP/Nylon material and made of thermo Plastic Urethane (TPU). Wheels Are Injection Moulded under Controlled temperature and Pressure. Non Marking, Smooth & Silent. High Static Load capacity, low abrasion and high chemical resistance against salt, Grease and acids. Dia Width Bearings Load Kgs.